Fitness bands aren't just for adults. Now kids can get in on the fun, thanks to LeapFrog. The company has announced the LeapBand, an activity wristband for children between 4 and 7 years old. The $39 LeapBand will be available in August in three bright colors -- blue, pink and green. We had a chance to preview an early prototype of the LeapBand and found it engaging and intriguing, albeit a tad chunky. To encourage kids to get moving, LeapFrog uses a rewards system that exchanges movements for points. An energy bar framing the page fills up as your child completes specific activities or movements as detected by the device's onboard accelerometer. We tapped the activity button above the screen and waved our arm around while LeapBand told us to "leap like a frog!" After a ten-second countdown, during which we were supposed to jump about, the energy bar moved from the top right corner of the display to the center right side. Instead of a touchscreen, the LeapBand uses a shatter-proof 1.44-inch TFT display with three physical buttons below and an activity button above it. Your child can use left and right buttons at the bottom to toggle back and forth through environments, and the center button acts as a home or return key for confirming selections or going back to the main page. The device is also water-resistant and ruggedized to withstand bumps and scrapes. On the home screen of the LeapBand is a Tamagotchi-like pet. 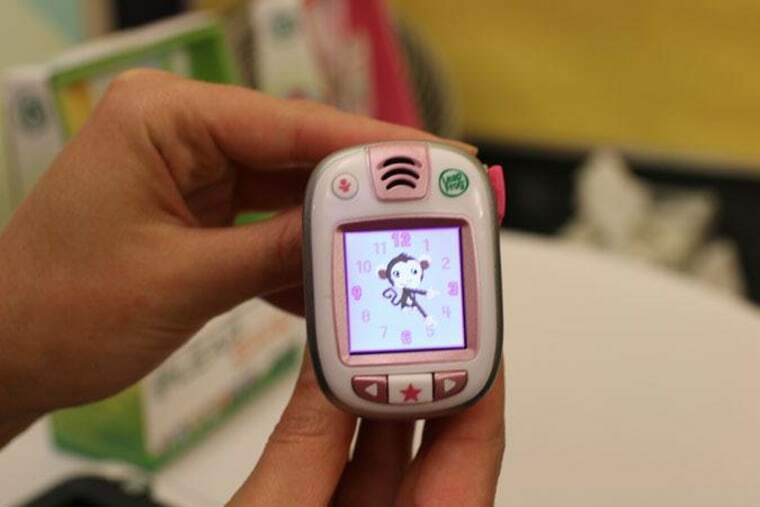 Each band comes with eight customizable digital pets, such as a panda, penguin, dragon, robot or cat, from LeapFrog's PetPals franchise. Your kid can interact with his or her pet in a plethora of games. Pet Dance is a mini game built into the watch that teaches your child sequences as he or she follows patterns to get the pet to dance. Pet Chef challenges Junior to collect fruits and healthy food items on a plate as they fall from the top of the screen, while avoiding dirty socks or shirts. These activities are intended to teach your kids to lead a healthy lifestyle, but some of these lessons are more subtle. For instance, using healthy food items in Pet Chef instead of fast food or desserts as a way to encourage kids to eat better could be a lesson lost on toddlers. We do like that Pet Parlor, which gets your kid to clean their pet when it is dirty, drives home the importance of keeping clean. Each LeapBand comes with 14 preloaded activities (such as "Walk like a crab" etc), but parents can download up to 50 different commands through LeapFrog's connect app (on iOS, Android devices and LeapFrog's Ultra tablet). Through the app, Mom and Dad can also designate goals and specific actions for Junior to reach, monitor how well he is doing and silence or lock the LeapBand by activating School mode or Sleep mode. While it's still in development, we're intrigued by the fun activities LeapBand has to offer kids in its target age range, all for a very affordable $39. We look forward to getting a unit for a full review, so stay tuned.